On the 21 June 1894 the Watch Committee minutes recorded the first mention of the use of matrons at Manchester police stations rather than just at the Police Courts for the purpose of attending to the female prisoners. The WC had been petitioned by the influential ‘Manchester Women’s Christian Temperance Association and Police Court Mission’ with a view to better treatment of arrested females. The MWCTA & PCM were most interested in those females arrested suffering the effects of persistent drinking. The MWCTA was formed in 1875 and established branches throughout the city, as an initiative of the British Temperance Association. The area of interaction between the police and the female prisoners and their subsequent process through the courts and sentencing was the principle focus of the Police Court Mission. In 1894 they petitioned the WC for the right to have a female police matron in every station to attend and counsel female prisoners who were otherwise vulnerable to the harsh conditions of a male-dominated prosecution regime within police station. However, this was firstly aspirational as many practical difficulties arose not least the matter of cost and accommodation and recruitment of the matron herself. The relevant minutes (below) reveal the initial reluctance of the Chief Constable stating it was ‘both unnecessary and undesirable to appoint a matron at the outside stations, adding that ‘the wife of the reserve officer could be used if necessary’. In fact it was already common practice to utilise the wives of officers for searching female prisoners. However the MWCTA campaign was successful and within two years the Chief Constable’s successive annual reports was observing that the Goulden Street PS matron system continued to work well. The WC minutes entries reveal this process. 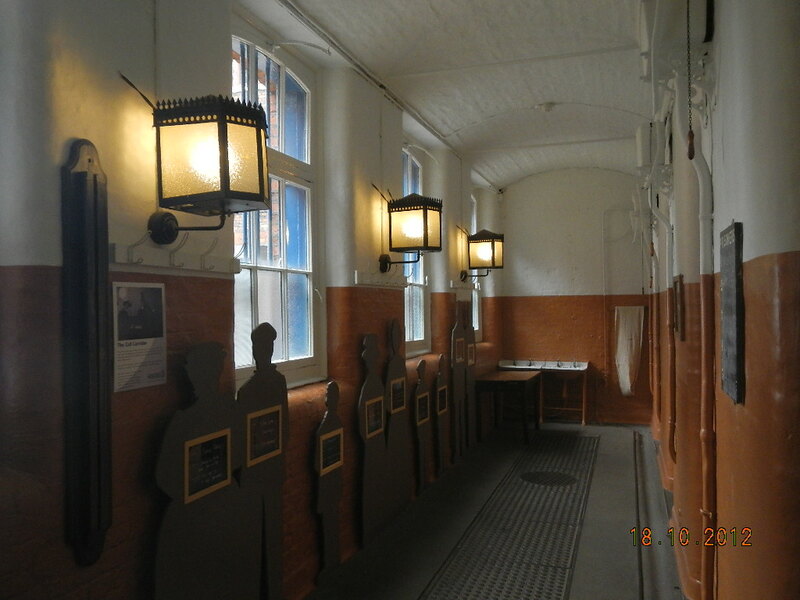 The main problem of matrons in every station was the sheer numbers that would be required to cover a 24-hour period (four per charging station on 6¼ hour shifts) and also the practical problems of housing of female prisoners in separate areas of the cell block plus accommodation for the matrons. The problem was clearly not the outer stations in the suburban areas but those in the poorer districts where inebriate females were considered a commonplace. The solution lay in centralising the detention of female prisoners in one local station where specialised facilities could be most effectively and cheaply supplied to the satisfaction of the MWCTA. After some thought and contrary to the Chief Constable’s desire for Newton Street PS or even Minshull Street Police Courts, Goulden Street PS was selected. The necessary alterations required dividing the existing 19 cells and the cell corridor and utilising the central cell for the matron. This innovation was to have a knock-on effect in altering the cell requirements elsewhere such as Newton Street PS which remodelled completely its cell and charge office, removing the four female cells and leaving only the five male cells. 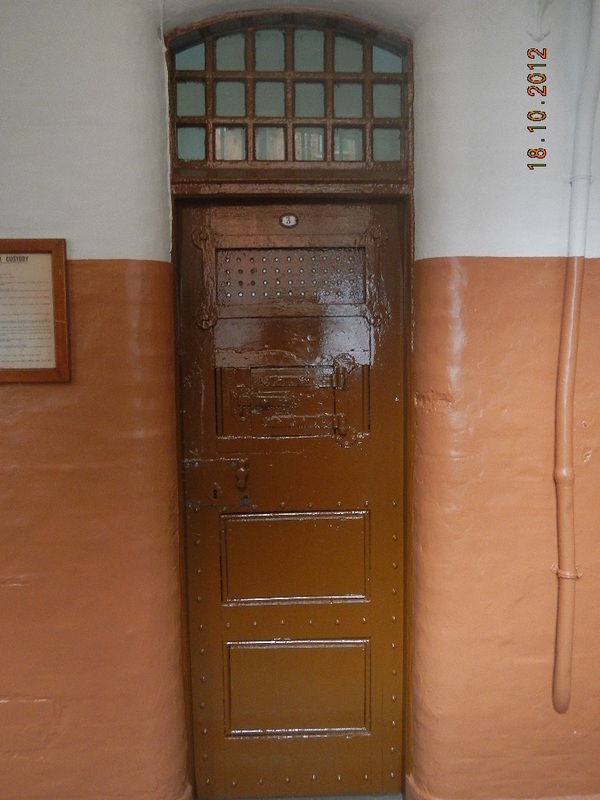 One practical consideration of providing for female prisoners supervised by male officers was the modification to cell doors. 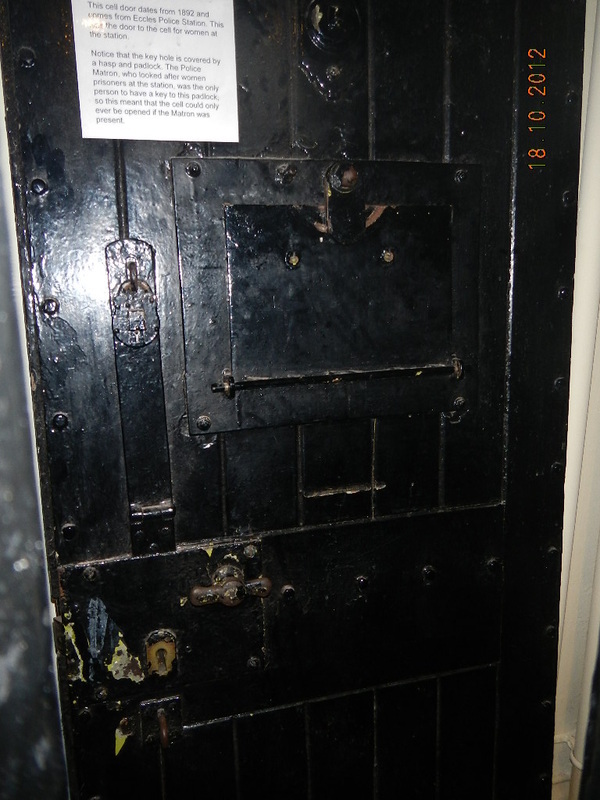 An additional steel flap was added to the outside which could be padlocked down by the sergeant or matron over the standard cell key hole, thus preventing any unauthorised access in their absence. Fig 23 (first photograph) shows the additional flap from door taken from Eccles PS in 1892. Fig 24 is a 1879 door at Newton Street PS. Note serving hatch and steel plate ventilation and glass fan lights above the door. Fig 25 shows the cell corridor at Newton Street PS. 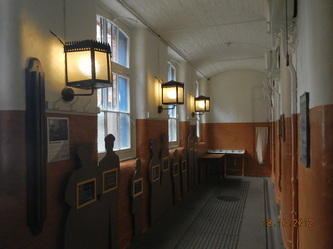 (The opposite corridor from the charge office was the female cell wing which was demolished for the Weights and Measures Dept. [See Station Pages/ 1860s/ New Town Hall for comparable images of the nearest other cells]. 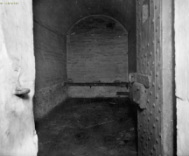 Figure 23 Photograph Female Cell door. 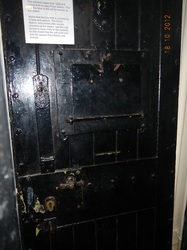 Figure 24 Photograph Male cell door. 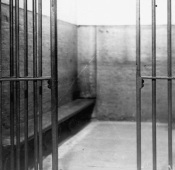 Figure 25 Photograph Newton Street PS cell corridor. 21 June 1894: The ‘Manchester Women’s Christian Temperance Association and Police Court Mission’ interested in rescue work are wishful to have Police Matrons appointed to look after the women arrested and detained in the stations. They request an interview with the Watch Committee. Granted for the 28th June 1894. The Chief Constable reported that a court matron was already in place [Minshull Street Courts] and in some stations for example the wife of the reserve office was used if required. There was no accommodation for a resident police matron at any police station and that 5,318 female prisoners were detained last year. He felt that, it was both unnecessary and undesirable for a police matron at the outstations and at most a matron at the four divisional stations. He offered to devote Newton Street PS exclusively to the reception of female prisoners and appoint three matrons for the full day. There was also the small expense of cabs to convey prisoners to Newton Street PS but this was ‘infinitesimal’ compared to employing matrons at all divisional stations. 6 September 1894: Re Mr Gamble’s [Temperance Association’s Solicitor] request for matrons. The Lock-Up Sub-Committee had considered Goulden Street PS, Newton Street PS and Albert Street PS and that Goulden Street PS was most suitable for the purpose. 17 January 1895: WC resolution that subject to the General Council that the matrons will be tried out at Goulden Street PS. 12 March 1896: Chief Constable’s annual report detailed Goulden Street PS structurally adapted for the reception of female prisoners. Four police Matrons were engaged to attend upon them. Manchester Watch Committee Minutes, 21 June 1894. Greater Manchester County Records Office with Manchester Archive, [GMCRO&MA] Records of the Manchester Women’s Christian Temperance Association and Police Courts Mission, Executive minutes GB127,M286/1. Volume 1 1880. B. Harrison, Drink and the Victorians (London: Faber and Faber, 1971) p.87 and C. Eustance, J. Ryan & L. Ugolini (eds), A Suffrage Reader: Charting Directions in British Suffrage History (London: Leicester University Press, 2000) p.78. Still preserved at the Greater Manchester Police Museum and Archive, 2013.